Ceramic Fiber Cloth with Vermiculite Coating : Ceramic Fiber Cloth, Ceramic Fiber Cloth Manufacturers, Ceramic Fiber Cloth exporter, Ceramic Cloth, Ceramic Cloth Manufacturers. Trademark of E.I. DuPont, USA. 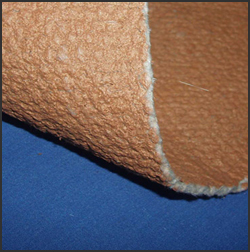 Compared to uncoated Ceramic fiber, vermiculite coated Ceramic fiber fabric cloth has little irritation of skin and provides increased resistance to high temperature, flame, and abrasion. In addition, the vermiculite film helps to seal against gases and liquids. Vermiculite Coated Ceramic Cloth is completely Non-Flammable. Used in welding blankets, Stress relieving, Removable Insulation Covers, Fire Blankets, Fire Curtains, Expansion Joints, Oven Door Seals, Flue Ducts, Flue Liner Protection, Cable Protection, Pipe Wrap, High Temperature Gaskets.